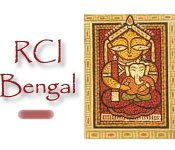 I have been looking forward to the Bengal version of RCI ever since I had lipsmacking Bengali food at a friend’s place. Her mom was here for a month, and she had made around fifteen dishes excluding three varieties of sweets. Phew, just the spread had hubby and me drooling:-D. I kept telling my friend and her mom that they should have invited us for dinner 3 nights in a row then, we could have done justice to all these dishes! I had enjoyed one curry in particular that night, the Bengali Egg curry. When RCI was announced, it was a very good excuse for me to try that curry at home. Heat a tbsp of oil in a pan on medium heat. Add the cardamom, cloves and cinnamon. Saute for a few seconds and then add the ginger and garlic. Saute till fragrant and then add the chopped onions. Saute for 3-4 minutes till they are soft. Add half of the chopped tomatoes. Let tomatoes soften. Cool this mixture and then grind to a smooth paste with water as required. Heat remaining oil in another pan. Add the boiled eggs and fry till outer layer is golden brown. Remove and drain on paper towels. Now add the potato chunks and fry till cooked through. Cook on medium heat and flip pieces as they crisp up and turn brown. Remove and drain excess oil. Reheat the oil in the same pan. Add the turmeric and red chilli powder. Let sizzle for a few seconds. Now add the ground paste and ½ cup Water. Saute on low heat for 7-8 minutes till gravy is thick and has changed colour to reddish brown. Once the gravy is done, oil will float on top. Now add the fried eggs and potatoes, remaining chopped tomatoes. Season with salt and stir well. Bring to a boil and remove from heat. Serve with Saffron rice. Meanwhile, warm up milk and saffron in a small cup in the microwave (2 minutes). Check if rice is cooked (without being too soft/sticky). Drain excess water and pour saffron and milk mixture on top. Lightly fork together over medium heat. Cook covered for 7 minutes.Remove from heat and let stand for 5 minutes before serving. These are my entries to RCI:Bengal hosted by Sandeepa of Bong Mom's Cookbook. Looks like a feast! Nice entry Namratha! iam drooling here on egg curry..got to try this. Loved your saffron rice with simple ingredients. Nice Bengali Egg Curry Namratha, I will try it out sometime soon. amazing... I just had lunch and I'm hungry again! i am planning to try some bong food this weekend too. so excited about that! am busy collecting recipes for egg curry...so this goes in as well....good entry!! thanks Lavi, do try it! The egg curry has me drooling.. we are huge egg curry lovers at home.. :) That with pulao must be awesome. :) Laavi, we love eggs too!